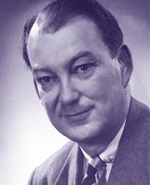 (1947-1967) Impressed by his military medical research and international reputation, Western officials were fortunate to recruit the remarkably young and accomplished Dr. Hall as the Dean of Medicine in 1945. By age 32, Hall had earned a bachelor's degree in agriculture, a master's degree in biochemistry, a doctorate in physiology and a medical degree. By the outbreak of the Second World War, he had published 40 scientific papers and been appointed full professor at the University of Toronto's Banting Institute of Medical Research. By 1947, at age 39, he became the youngest president of any North American university. At that time, Western was a small regional institution, teaching fewer than 1,000 students, who represented less than five per cent of Ontario's total university enrollment. When Hall retired 20 years later, Western was home to more than 10,000 students - about 10 per cent of Ontario's total - despite the fact that the number of universities in the province had quadrupled. It was under Hall's leadership that Western acquired much of its modern academic shape and physical character. To keep pace with student demand, facilities were dramatically expanded and new academic schools, departments and faculties were created: Business, Education, Dentistry, Library and Information Science, Music, Engineering and Law can all trace their beginnings or revival on campus back to Hall's era. The Faculty of Medicine also found a permanent home on campus during this time. Hall believed in excellence in both teaching and research and brought many distinguished scholars to Western thanks in part to his own reputation. During the boom-years of his tenure, Western grew to become Ontario's second largest university and one of Canada's leading post-secondary institutions.